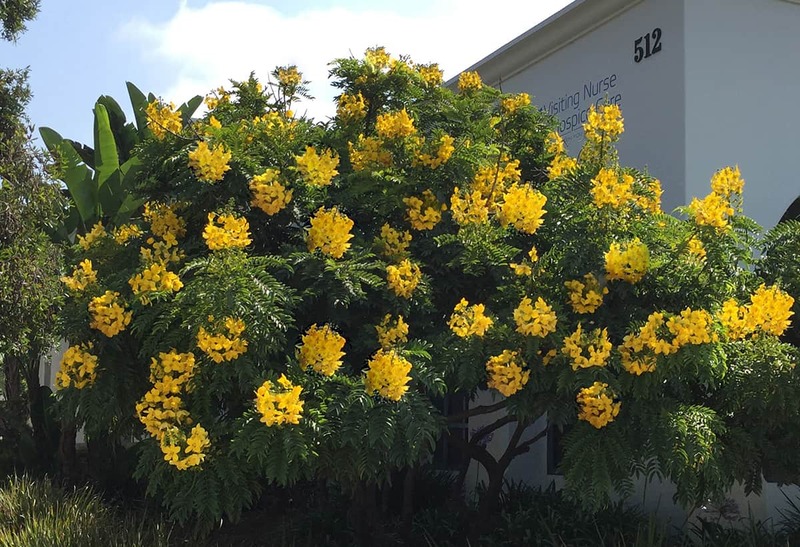 The Gold Medallion Tree (Cassia leptophylla) is certainly the one of the most spectacular of all of the flowering trees. 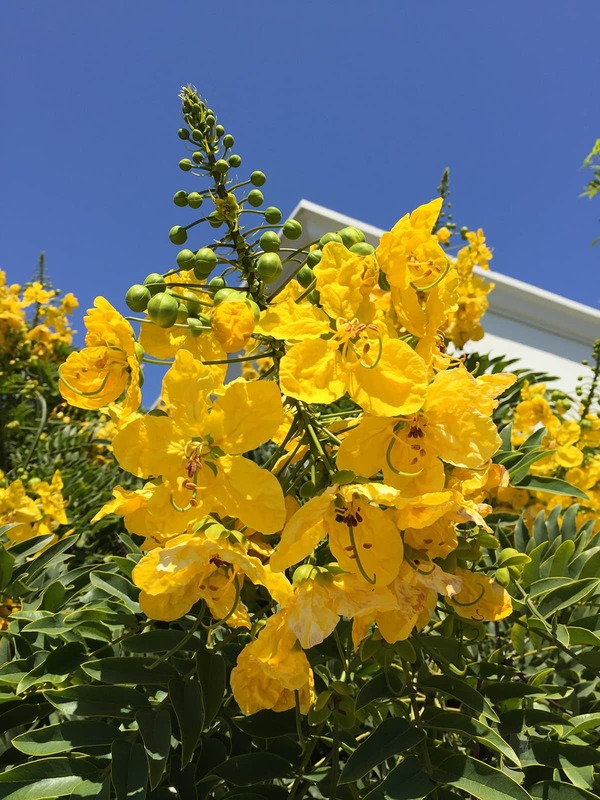 In summer, its clusters of vibrantly deep-yellow blooms, 8-10 inches long and wide), appear at the ends of soft-green leafy branches – every cluster looking like an enormous bouquet of 15-30 individual flowers. This fabulous floral display can last a month or two on each tree! After the flowers are spent, long, brown, four-sided seed pods (often up to 2 feet long) develop and dangle delightfully for a long time. Oddly enough, the Gold Medallion Tree is in the legume family – as is the common bean – so, the pods contain bean-like seeds that are not eatable. This graceful, small- to medium-sized (up to 20’), semi-evergreen tree, with a rounded crown and reddish-brown bark, is native to Brazil, but grows very well in Santa Barbara’s Mediterranean climate if given occasional deep watering. It certainly does better in well-drained soils, becoming stunted in heavy-clay soil. Eye-catching, these lovely trees cannot be missed when in bloom all around our town. Look for nice specimens in Alice Keck Park Memorial Gardens, in MacKenzie Park, State Street in the 800 and 1000 blocks and below Gutierrez Street, and at Gutierrez at Olive Street.